Since guitar is my third instrument (I don't have a second instrument), I thought a page dedicated to it was appropriate. This rather long-titled website has lots of information on guitars and more. Here is a good overview. The Hammond Innovex Condor GSM guitar Synthesiser. Jimmy Hendrix bought one of these in 1969. Today we would call this a guitar FX unit. GM Arts has comprehensive coverage of guitars, amps, and much more fair dinkum information. Don Tillman's site has three articles on the theory of guitar pickups. Several people have compiled their pick of the best 100 riffs and put them on Youtube. Now Alex Chadwick from the Chicago Music Exchange has made a video of himself playing his pick of 100 riffs together. If you want to also follow the riffs on TAB check it out here. Recently this unusual guitar was for sale on Trade Me. It turns out that it was built by a guy named Ray Simpson in the 50s. It has an electrostatic pickup with a built-in valve pre-amplifier. With 5 controls and 4 valves it is probable that it featured tremolo as well. Way ahead of its time. Safety-wise it would have been an electrocution waiting to happen, as several hundred volts were needed for the valves. I had one of these for my very first stomp box (in 1971, from memory). It sounded great and the 'Expander' acted as a gain control, setting the amount of distortion. The second footswitch changes the tone from Fuzz (which is just that), to Normal (which is via a LPF). Now, for the sad part of the story...next I got a wah wah and when I connected the two together there was an unwanted squeal (not to be confused with the wanted squeal, which was me trying to mimic Hendrix). I took them both back to the music shop for the technician to check out. Imagine my dismay when a week later I returned, and they were brought out to the counter - the retailer read the tech's card "wah wah ok, fuzzbox dead (all transistors)". What? they were both fine when I brought them in, apart from not being happy together (I now know that the problem was simply an absurd amount of gain causing feedback, but as a teenager back then I had no idea). 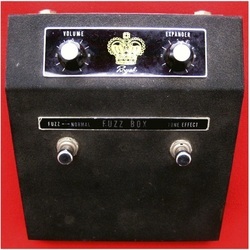 Anyway, my nice Royal Fuzz box was indeed dead. The bloody useless tech that the music shop employed had completely stuffed it. I made quite a bit of noise in the shop that day, and managed to get $30 of a new guitar I was buying. But...I never did get another distortion pedal that had quite that sound. It is now featured here (with several Youtube videos demonstration its sonic qualities). And here. The circuit for it is posted here. This is a Mustang Ten and was made by Dimco right here in NZ. My one had an elliptical speaker (5x9"?). My first modification was to add an external speaker socket and use a 12" Rola speaker. Below you can see what's inside - not much. I had an external spring reverb. 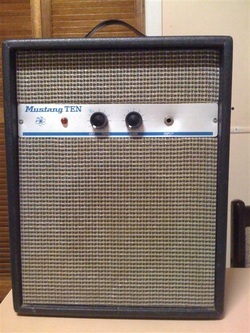 My second guitar amp was also a Mustang (hmm...where did the NZ manufacturers get that name from, I wonder...). These were made in the late 1960s by Fountain, who also made home stereo equipment. It was basically a copy of a Fender Twin Reverb (or maybe a Vox AC30). When I say copy I don't mean an exact copy, but it did have 2 x 12" speakers, two input channels, and tremolo, in a combo case. I bought mine second-hand and from memory paid $350 for it. I worked over the entire summer break to get the money for it, as it was a lot more than the Dimco which cost me $50 new. My first guitar was one of these (I started learning on my sister's acoustic guitar). It cost me $33 (cardboard box included - this was important as I was a school-kid with no money for extras). The brand name is Diplomat and they were made in Japan (by Aria, apparently). Overall not very good but probably still a bit better than the very cheapest Strat copy today. The neck was actually not too bad. The one in this photo has an interesting story - when Stevie Ray Vaughan was touring NZ in 1986 he bought it for his new girlfriend. It is now in the SRV museum. Here is the second guitar I ever owned. Again I don't have a picture of the very one, but this one (with its missing knob) is the only picture I could find. 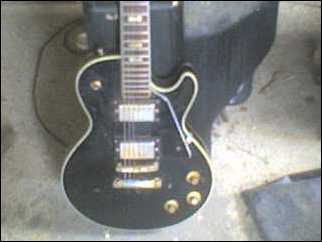 Clearly a Gibson Les Paul copy, it is another Japanese made guitar and the brand was Sakai. Better than Diplomat, but not as good as Ibanez, and nowhere near the real thing except in looks. Mine was the red wine colour, and it came with a proper case. Is it a Phaser or a Flanger? a Phaser of the Star Trek kind. Ah, another myth to debunk...and here it is "both phasers and flangers use the same time delay techniques to create their sounds, but a flanger sounds more intense because it has feedback". This explanation can be readily disproved because although flangers commonly have feedback, it is not unusual for phasers to have it too. Ok, so what is the difference? A phase shifted signal (using a series of all-pass filters) is mixed with the original, creating notches. These notches are related to the various wavelengths of the input signal, so the harmonics are delayed by varied amounts and are therefore not harmonically related. Phasers are explained well in this Youtube video. Circuit design: RC filters (using opamps) form the phase change network. R can be varied in a variety of ways: lamps (or LEDs) and LDRs, FETs, OTAs, CMOS switching…(sometimes using a proprietary IC). FETs are the most common device used. Things get increasingly complex as more stages are added as the FETs, or LDRs must be matched. You can check out some Phaser circuits here. The effect was originally achieved in the 60s by having a second tape machine double tracking. The second tape speed was slowed slightly by manually pressing against the flange of the tape spool (hence the name). Soon after, this was automatically controlled. The electronic version was developed after the Phaser (in the 70s when BBD became available). ƒ notches that are harmonically related to the input signal. 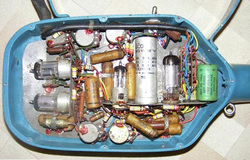 Circuit design: one or two BBD devices provide the delay. The modulation is achieved using an LFO to drive a PLL IC which clocks the BBD at a slightly different speed. So, which sounds better? That's hard to say. A phaser creates a 'thicker' effect due to having many more notches than a phaser. Some people say a flanger is more natural sounding because the notches are harmonically related to the input signal. OTOH, to get a good flanging effect requires quite a lot of it, so it can become more of a special effect than being musically useful. Phasers do sound other-worldly, but can be applied in a subtle way. Note: Here I have been writing about analogue methods of producing these effects. Both Phasing and Flanging are now produced using DSP (plugins & digital stomp boxes). This SOS article also explains the difference. Quite a big topic; probably 50% of Internet forums are on this very subject! There is even a movie about it (Fuzz), and there must be hundreds of models of distortion 'stomp boxes' that have been made. Op amp for gain + back to back signal diodes (1N4148) shunting the output. Op amp for gain + back to back signal diodes (1N4148) in the feedback loop.